Rooftop heating and cooling units are made by many manufacturers. Some units are delivered with a full refrigerant charge. This means there are no refrigerant lines to connect. This cuts labor costs and installation time. Since the unit is on the rooftop, no inside room has to be allocated for the heating and cooling equipment. This unit uses gas for heating up to 112,500 Btu. The cooling can reach 60,000 Btu or 5 tons. Typical installation systems are shown in Fig. 16-3. One of the advantages is that heat and cooling can be added rather quickly in the construction phase. The installers can work in comfort and thus improve their efficiency during the construction phase of the building. 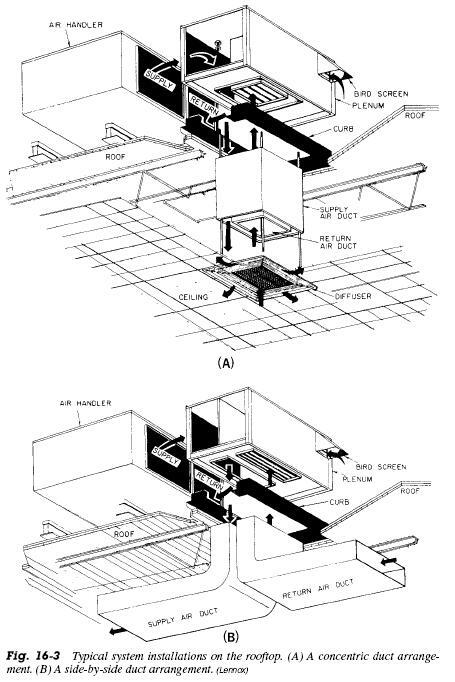 The unit can be set in place on a slab at ground level. The duct, gas, and electrical connections can be made to it at that location.